This article discusses the latest electric riding mowers for 2017. Unfortunately out of the 100 or so that have tried to enter the market in the last 10 years only three are currently being sold in the U.S. The rise of sustainability by large corporations has affected commercial landscaping activities considerably in the last five years and these corporations are demanding that landscapers use equipment with environmentally friendly features. Some corporations are going as far as requiring landscapers to use ONLY electric mowers and handheld equipment. 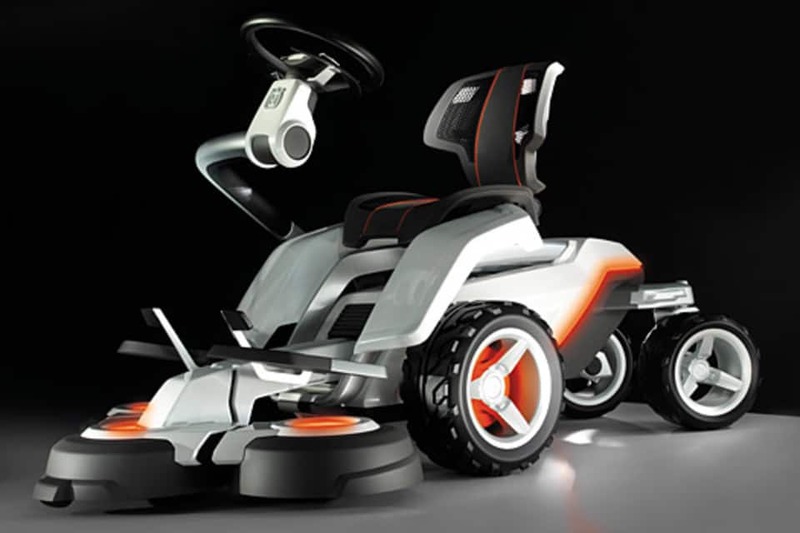 My hope is that the large manufactures will accept the responsibility to develop and maintain eco-friendly residential models that advance the cordless electric riding mower. Cordless electric walk-behind mowers are getting better every year. This year there will be around 20 different cordless electric walk behind mowers that will mow well and last. Most of them are using 40, 56 and 80 volt interchangeable lithium batteries to give you enough run time to mow your city yard or trim your suburban yard. The batteries all plug in – just like your cordless drill so when you run out of juice just change it out for a freshly charged one. Riding mowers (except one) are not quite as advanced. We are still waiting for real changes. Only one of the major manufacturers (MTD) currently has an electric riding mower. Others, for example Husqvarna, showed us what it could do five years ago but never made good on the Panthera Leo. The Panthera Leo deck was so revolutionary I still think the Leo could change the way we mow our yards. They even developed the Husqvarna Rider Battery but never brought it here to the U.S. Unfortunately, the large brands like Husqvarna appear to still be focused on cramming robotic mowers down our throats – even though it’s already been proven that the technology they are using in Europe is not compatible with the type of grasses we use and the height at which we cut our lawns. The Robotic Mower is just not something the U.S. market is interested in. A few other big brands (Ariens Amp, Hustler Zeon) tried between 2000 and 2010 but they failed for two reasons at that time. First, the brushless motor still wasn’t ready for what we wanted to do with it and second, they were still using conventional design on the mower itself. Outside the box ideas: It appears someone completely new with the technology and has the resources to think outside the box will have to come along and make a cordless electric riding mower North America can use and afford. For example, instead of heavy steel mower decks that need the rigidity to keep v-belts from slipping and the kids from knocking the decks off the mower, electric riding mowers could use rugged lightweight poly decks that fold away on impact. The decks could still be strong enough to pass the required government projectile tests. Batteries (even deep cycle lead-acid) could be located well below the current center of gravity making the mowers much more stable on slopes. Lower center of gravity and balanced weight on all the wheels would allow smaller cordless electric mowers that are stable enough to mow around tree roots and berms without the fear of tipping over. That said, I’ll jump down off my soapbox….. Here is a quick rundown of the three available now. Noise: All-electric and hybrid riding mowers are much quieter than your gas-powered lawn tractor but they still make noise when the blades are engaged. The noise is still loud enough that you may want to wear hearing protection. The Ryobi RM480E is new this year and features a proven battery and propulsion system that will give you years of use. No gas, no oil changes, no real maintenance besides blades and cleaning for years. This mower uses standard deep discharge batteries for long mowing time and long battery life. With the RM480E, you get all the benefits of owning a fully electric riding lawn mower without sacrificing power, performance or features. 100 AH Batteries: Ryobi RM480ex 38 in. Battery Electric Riding Lawn Mower Up to 2.5 hours run-time! While you are there buy the Ryobi Gas-Like Power 40-Volt Lithium-Ion Cordless String Trimmer/Hedge Trimmer and Jet Fan Blower Combo Kit and throw the old gas can away! One big advantage that’s not advertised: Performing yard work with an electric rider. My wife loves to work outside on her landscaping. It’s her therapy. She is constantly moving from one landscape bed to another trimming that branch, pinching off that flower or changing a plant that has flowered for another yet to bloom. A Cub Cadet yard cart stays attached all the time. An electric rider is perfect for her. No noise, no choking the engine and waiting for it to warm up. She just turns the key and goes from bed to bed. She doesn’t mow the yard so the electric rider’s battery easily lasts a week or more before it needs to be plugged in and charged. 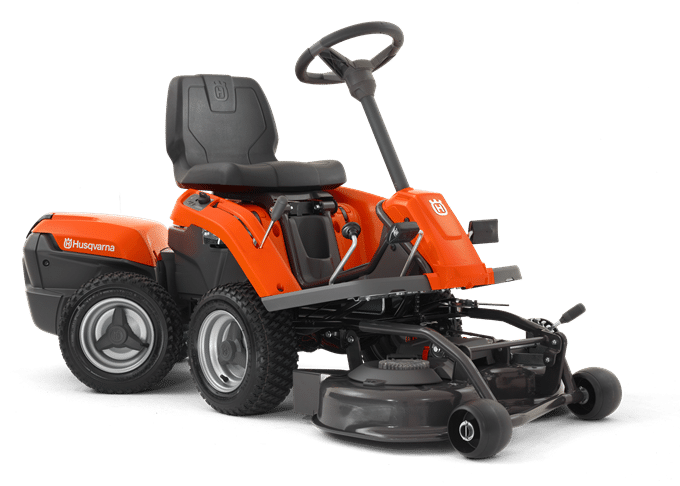 To give you a little perspective on the 3 electric mowers available here in the U.S. Husqvarna sells in the rest of the world the Husqvarna Rider Battery. It uses a 36 volt 125 AH hour battery, 1500 Watt drive motor and two 800 Watt decks motors. The deck is 33 inches (85 cm). It has a maximum runtime of 90 minutes. Cost in U.S. dollars – $3999. If you like to tinker around the yard and don’t mow more than an hour or so at a time the Cub Cadet RZT S Zero is a wonderful mower. Cub Cadet has taken their steering wheel zero turn and replaced the belts, pulleys, transmissions and gas engine with electric motors and batteries. The RZTS Zero has been on the market for over 3 years and is proving to be a very reliable mower. The Cub Cadet RZT S Zero has four features that make it a great choice. No Gas: On your way home from your Cub Cadet dealer with your new mower stop by your local Sears or Home Depot and buy a cordless Craftsman, Ryobi , or EGO Garden System and when you get home – throw the gas can away. 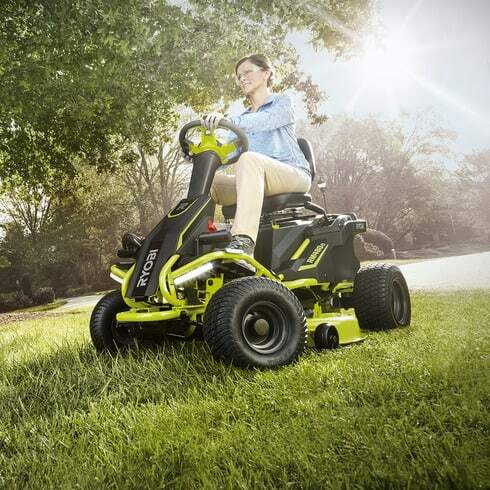 State of the Art Drive System: Even though this mower uses a deep discharge battery instead of lithium-ion it uses the latest technology to make the best use of battery’s capacity. The 48-volt floating ground system uses 4 of the latest 3-phase brushless DC motors for propulsion and the deck. Two motors for the deck and two motors for the all steel gear transmissions in the rear. Each motor’s speed is precisely controlled. 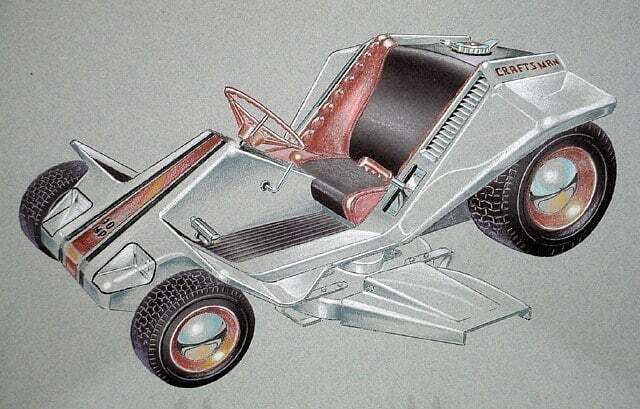 It incorporates a regenerative circuit for downhill braking that actually charges the battery. A True Zero-Turn that will handle slopes: You know what I think of residential zero-turns. Most of the models on the market work great on flat land but are scary or impossible to drive on slopes. The RZT S Zero is different. It uses steered wheels in front (instead of caster wheels) so that you have full control over the mower all the time. It will handle 15 degrees or less slopes just as well as your lawn tractor. The weight of the batteries is centered over the rear wheels to give you the best traction possible. The steering wheel and foot controlled speed controller make it as easy to drive as your car. 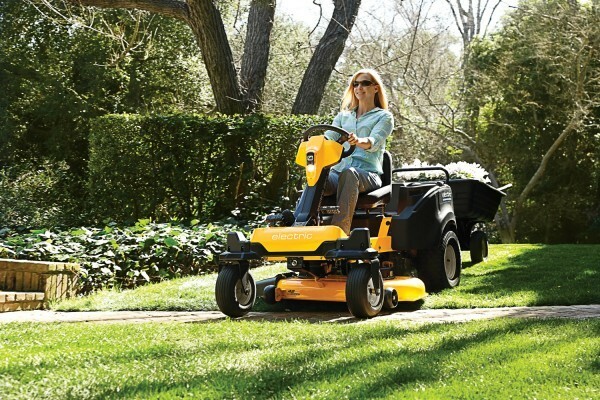 Cub Cadet’s best 42 inch deck: A big advantage with today’s electric mowers is the blade tip speed is precisely controlled. If one or both blades encounter heavy thick grass the speed sensor in the motor automatically keeps the blade at a constant RPM. This feature in combination with the fact that this is Cub Cadet’s best 42 inch deck assures that you will always get the best cut possible. But, it doesn’t stop there. If you are mowing light grass the electronic controllers reduce the current to the motors saving the battery and extending the mowing time. Note: When you first get your new RZT S it may not give you the full hour of run time. The brand new batteries take about 10 charging cycles to reach their full capacity. This Cub Cadet RZT S Zero is not totally free to use but there are still considerable cost savings over the gas or propane powered equivalent. All electrics like the RZT S Zero that you plug-in and charge are not without cost because you still have to pay for the electricity. Electric car owners are seeing about a 70% savings over a 40 MPG car and I expect these riding mowers to give you about the same cost advantages. Of course, the actual cost savings depends on your local electricity rates and the current price of fuel. In addition to the charging cost, conventional deep discharge batteries like the four in the Cub Cadet Zero have an expected life of around 4 to 6 years or 400-600 cycles and cost around $200 EACH. (industry average) In comparison, the Mean Green lithium batteries below have an expected life of around 1500 cycles or 10-15 years. Mean Green Mowers has a complete line of lithium-powered commercial riding, stand-on, walk-behind and trimming mowers. They feature interchangeable high-capacity battery packs that can quickly be exchanged to power their mowers all day long. This is the true “Tesla” of riding mowers – state of the art batteries, chargers, and electronics. Like the Tesla autos, there is no maintenance on these mowers other than occasional inspections for safety and a few grease fittings. No seasonal maintenance like oil, spark plugs, oil filters, air filters, hydraulic fluid, etc to purchase and store. Best of all, there is NO gas to purchase and haul around in your trunk! No storage cans of stale fuel sitting around your garage! Commercial owners are seeing savings of hundreds of dollars per month on parts and fuel alone, not to mention the high labor costs to accomplish the maintenance. The additional cost of the batteries quickly is offset by maintenance and operating savings over gas-powered equipment. The mowers themselves are true commercial grade mowers and cost about the same as an equivalent commercial gas-powered zero-turn. The battery packs and chargers are additional. Did I mention how quiet they are? I’m in the market for a riding electric lawn mower. The deck size is not as important as reliability and the ease of removing the blade for sharpening. You advice as to a suitable product would be most welcome. Thanks for the review. I just got the RM480E and may return it for the EX – the E is great but more battery life would be better. As for the Cub Cadet – I figured it would be more delicate but I have no data to back up that opinion – do you think the Cub Cadet can handle rougher ground better than the Ryobi? Money is not the issue here – I just want the longest lasting more for “somewhat rough” bumpy ground. The Ryobi is doing fine. Excellent article. Great information. Very informative. Are you aware of Ryobi, or anyone, planning to make a dual lever controlled electric true ZTR mower? It appears this unit is able to go into reverse and keep the blades cutting, but still not the agility of a true ZTR. Hi Paul! Need your opinion on what is best for a 27% incline – that’s right – 27% incline and it’s about 40 acres worth. What would be the best option here?